The Shaw 650 sportboat design delivers superior sailing performance, with a proven track record as one of the fastest production 6.5m sportsboats available in the world today. A sportboat is a performance day sailor designed for performance, safety and stability. The Shaw 650 brings speed to more people, with maximum performance at this size, combined with affordable pricing. 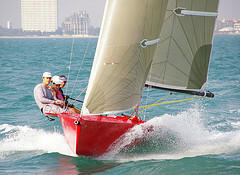 Enjoy sailing a boat where every gust provides instant response in terms of speed and acceleration. Lightweight and well mannered, easy planing and easier transportation – this is the answer to performance fleet and one design racing! It is one of the quickest sportboats in this size, competitive in keelboat, sportboat and OD fleets, offering highest levels of specification and construction at a reasonable price, with long term value thanks to NZ technology and expertise in construction and high quality parts. the boat is easy to sail, with low sheet loads, easy to rig and transport. Every boat features the same high quality of construction which has been created by marine professionals in New Zealand and around the world most of whom also own or race Shaw 650s themselves.